You may already have Cost Centres you wish to use that are attached to valid ledger accounts but several Cost Centres for different year levels or groups can be created if required. To create a new Cost Centre follow the steps below. Enter your description for the Account to be used in Billing or for a Discount. Optional; The Value, this is not used for Billing. How this is charged does depend upon setting in System Maintenance. 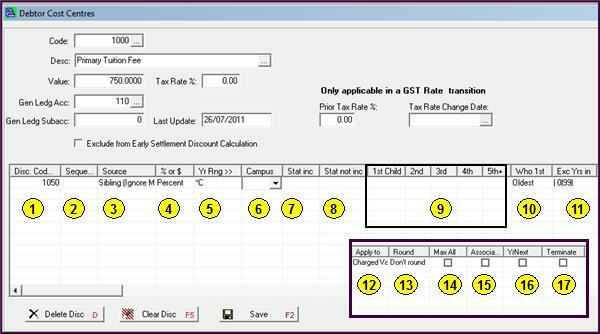 Select a valid General Ledger Account. The Sub Account will default if attached to the GL Account selected. Tick if this item is to be excluded from any Early Settlement discount. You are now ready to create your table of discounts. This is an overview of the different columns and their role in the table. 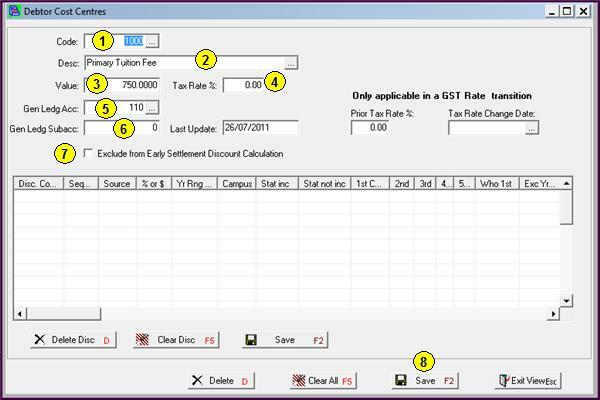 Select the discount Cost Centre Code to be used. Select if this is a Percentage or a Dollar value Discount. The Discount can be based on Campus if Campus is used. Siblings; If this line is for Sibling discount enter the values as a % or $ value. Round; The default is ‘don’t round’ but you can select to round to the nearest 1, 5 or 10 dollars. Max All if ticked will give the Maximum Student discount to all Siblings. A sort order has been added so the Sibling discount is calculated last. Discounts are based on a percentage. Year *C is used for calculating the Students. All the values have been entered. Where Terminate is ticked no other discounts will apply to these lines. Discounts are based on a percentage and a dollar value. Year *C is used for calculating the Students discounts. Balance After Discount has been selected for the Staff discount so any discount prior to this is applied before this discount line is applied. 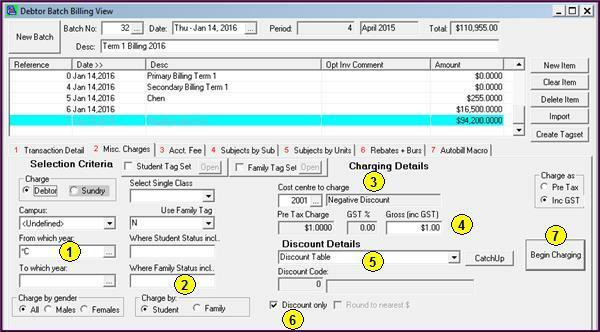 Once the discounts are entered for all Cost Centres you can continue with the Billing, these are examples only you must follow the billing appropriate for your school. 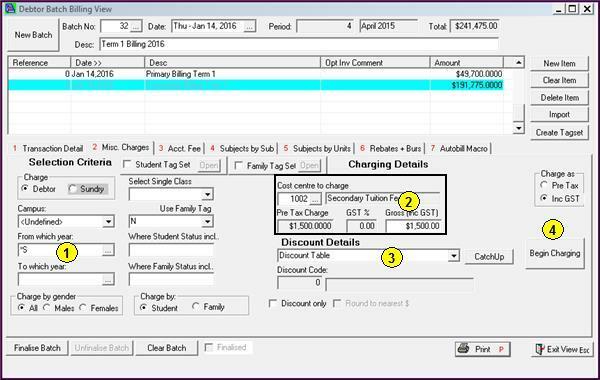 Create a Billing batch in the usual way and enter an appropriate Description. Select the Year Group you are billing or use a Tag Set for selecting Students. Select the Cost Centre to charge and enter the fee. Discounts will be applied with the billing. Add a New Item and a description and continue with the billing. The Staff Discount has been calculated on the balance after the $50.00 discount. Sibling discounts and the Status C discounts have been applied. Hardship discounts have been applied. You can add a negative discount that will create a charge based on students. 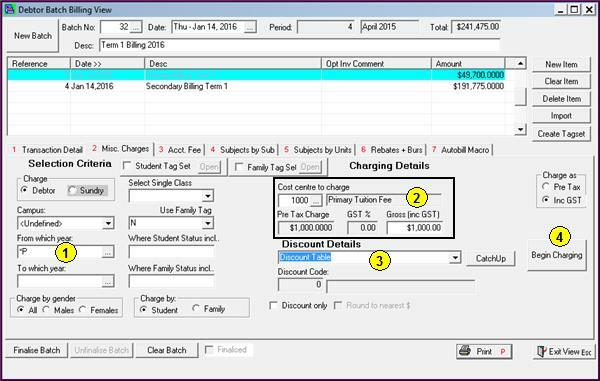 Create a billing batch in the usual way or use an existing open billing batch, go to the Misc Charges tab. Select to Charge By Student. Enter a token value of $1.00. Select to use Discount Table. The Students will be charged a positive amount based on the Discount Table with the negative amounts. To calculate which sibling is oldest, PCSchool uses the Numeric Equivalence set in the Year Level Description table. When 2 year levels have the same Numeric Equivalence, this discount will be applied in the order a student is encountered, so it is possible the discount could be applied to either Year Level. To ensure the discount applies in the correct order, you can set a numeric equivalence to be a negative number.